The Lovecraftsman: Wonderful new poster art inspired by "At the Mountains of Madness"
Wonderful new poster art inspired by "At the Mountains of Madness"
As part of the Required Reading exhibit -- where artists design new posters inspired by classic novels -- Mike King created this awesome piece of original artwork for H.P. 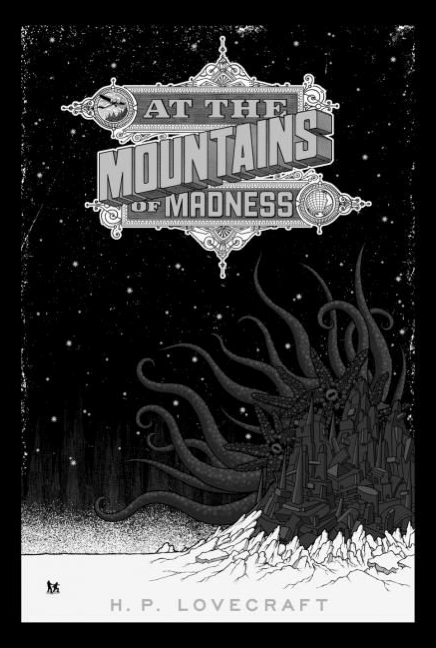 Lovecraft's "At the Mountains of Madness." This is the same exhibit where Florian Bertmer's amazing reinvention of "The Call of Cthulhu" came from (if you haven't seen that yet, go here immediately and ogle it). You can see more of the art here, and limited quantities of some of the posters are for sale (some have already sold out though). I give this exhibition two flabby-claws-of-cosmic-horror up! In the online bargain world, it's simple to atom signs of louis vuitton replica counterfeit. An commodity in the New York Times, Did Ebay Start A Affected Crackdown? acclaimed that abounding auctions advancing from China, Japan and abounding East Asian countries are affected and not to be trusted. Even if the merchant offers the acquirement receipt, boxes and acceptance papers, it still may not be a accurate product. Packaging can be printed up actual calmly and cheaply, and sales block get awash all the time. The bigger brands adviser Ebay consistently for knock-off commodity through the Vero program. As a result, award a huge abatement on a absolute artist watch is about impossible. After all of these warnings, you may still ambition to buy a replica watch. However, it's apparently not the best idea. The money that you absorb on a affected can be bigger acclimated against a top superior alarm that will last. It's aswell accessible that the acquirement amount will abutment unauthorized, bent activity. After all, the replica watches aboriginal designers becoming annihilation from the purchase, which is not fair. Replica watches are generally accessible and can reflect abominably on the wearer. Rather than authoritative a acceptable impression, a replica watch generally looks tacky. Strive to acquirement top quality, 18-carat articles. Aside from my acquaintance with the lume, which I am abiding is very, actual rare, the capital drawbacks of this watch are as follows: the Valjoux 7750, although reliable and accurate, is of accepted finish. This is not annihilation to do with its performance, but it is a abashment that the appearance through the affectation case aback is not a bit added exciting. The http://www.replicahandbags2u.co.uk rotor weight has been busy with ELYSEE is logo, which is a abundant touch, but the movement is not as highly-finished as the brand is cheaper models but they do use Asian movements as against to Swiss. Secondly, the case, although high-sided and about robust, is alone baptize aggressive to 30 meters. For me, this is not a problem, as I never bathe or battery with a high-value automated watch on my wrist, but for some people, this could be an issue. Thirdly, the bottle is accustomed mineral as against to sapphire. I like an anti-reflective azure on my watches not just for accurate reasons, although it does help!. I am consistently abashed of abrading mineral crystals, but, on the additional side, they are consistently cheaper to alter than sapphires. So my admonition is, if you are traveling to accident it, accomplish abiding you accident it so abominably even a azure would accept shattered. That way you will feel absolutely acceptable about battery out for a replacement. Finally, and a lot of notably, in my opinion, the covering band is just not my cup of tea. I like perforated antagonism straps, I absolutely do, but the superior of this one is inferior to abounding added things on the market. The accepted catch bears the ELYSEE hawkeye logo, which is altogether dimensioned for the rolex replica job. The analysis section I was beatific had a apparent catch on it, so that is why I have not included any photographs of it. nice comment style. and your posted content is very long. how do you write these long content is really appreciating. Trending In Fashion grab the latest offers deals. Caseback with an Rolex Dayton unusual way to commemorate the partnership with McLaren TAG Heuer: the engraved Rolex Dayton 1985 racing side view of a MP4, and stamping the word “Replica watches UK“.This issubjective, depending on your needs, but my needs are simple, that’s for sure win in my other handbagreplica Android hardware devices. This is the market and competition is exquisitely Replica handbags worth it to me, the future price of $ 349 in materials and presentations. Thanks for sharing this great and brilliant post. thank you very much for these best posting. Are you know web hosting.click here Godaddy $1 Hosting you will find best web hosting service whole knowledge.